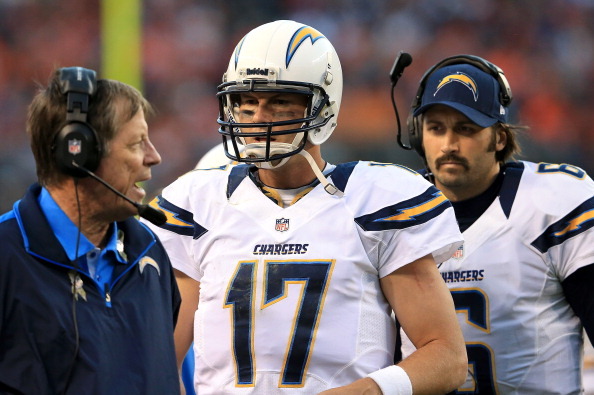 What is Wrong with the Chargers This Season? Since the heyday of the Shawn Merriman and LaDainian Tomlinson San Diego Chargers, the expectations for the Bolts have been far greater than the actual output on the field. Year in and year out, they are projected to make serious runs at a Super Bowl, and year in and year out, they fail to do so, often spectacularly. Somewhere along the way, the San Diego Chargers became the Dallas Cowboys of the AFC, doomed to receive far too much preseason hype than they probably deserve while flaming out when it matters most. This year, however, has been among the most disappointing seasons ever for this perennially disappointing franchise. What, exactly, has gone wrong? Statistically, at first glance, the answer isn’t obvious. The Chargers are 17th in the league in passing yardage and 22nd in rushing, which, while not great, are not catastrophically bad figures either. They’re the third-best team in the NFL at shutting down the run. With everyone piling on Philip Rivers and asking “what’s wrong with him?” it may feel redundant to heap yet more blame on the embattled Chargers quarterback, but facts are facts. Rivers has turned the ball over far too much this season. He has thrown 17 touchdowns to 14 interceptions, and coughed up nine fumbles to boot. He has four multi-interception games this season, and only two games without one. That is not a good recipe for success moving forward, but it isn’t entirely his fault. The Chargers have almost systematically dismantled the Chargers offense around him, letting his best wideout walk this offseason (Vincent Jackson to the Tampa Bay Buccaneers) and letting Darren Sproles go to the Saints the year before that. The loss of Jackson particularly hurts Rivers, who lost his best and only true deep threat when Jackson left. VJax has caught 42 balls for 863 yards and seven touchdowns in Tampa thus far in 2012. Of course, this isn’t to let Rivers completely off the hook; too many times this season, he has simply thrown the ball when he shouldn’t have. He has completed 67.1 percent of his passes so far this season, an astonishingly high rate, for a 7.24 yard per attempt average. Those numbers are comparable to the best years of his career, and in the case of his completion percentage, even better. That, more than anything, is a testament to just how badly his turnovers are killing this offense. Here is what Rivers had to say about his critical fourth quarter pick-six against the Bucs two weeks ago: “In hindsight, not only do I wish I was throwing it over his head, I probably shouldn’t have thrown the ball, period. Unfortunately for Rivers, there was no “we” in that play; that was a boneheaded mistake resting entirely on his shoulders. If he doesn’t stop throwing an alarming number of passes like that, the Chargers stand zero chance of righting the ship this season or in any season moving forward. Lucas McMillan is a writer for FootballSchedule.me. To checkout the week-by-week Chargers schedule as well as the latest NFL and college football news, visit Football Schedule. Follow Football Schedule on Facebook and Twitter @FBSchedule.